Wacom introduces its next generation of Intuos tablet range at the IFA show in Berlin. 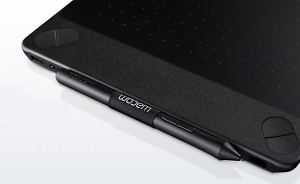 Wacom has announced the launch of a new touch pad and styli. Wacom has launched a new two-in-one graphics tablet that can also be used on the go. Wacom have released their next generation of tablets. Color Confidence introduce the affordable, high quality range of Hanvon graphics tablets to creative professionals in the UK. Wacom introduces a stylish addition to its range of interactive tablets that can enhance anyone’s creative flair. The ideal pen tablet for on-the-go professional creators of digital content. Wacom introduces first interactive tablet combining multi-touch and pen input. Wacom's Intuos4 voted best digital accessory in Europe by TIPA. Wacom’s Bamboo Fun pen tablet receives coveted international design award. Wacom reduce the prices of their most popular interactive pen displays and wireless pen tablets.